This drainage – which includes the Main Southwest, Northwest and Little Southwest Miramichi’s, as well as the Renous, Dungarvon and Cains rivers – is easily the most varied and productive Atlantic Salmon honeyholes in the world. You can catch more salmon per day in Russia or Iceland (and spend three or four times as much doing it), and you can catch bigger – and again more expensive – salmon in Norway, but day in and day out from June through October, the salmon fishing experience on the Miramichi and its lovely tributaries is second to none, particularly now that Canada has bought out most of the commercial nets that took such a big bite out of returning Miramichi fish in the 1980’s. Part of that experience is tradition: family lodges such as Wilson ‘s Sporting Camps that have catered to visiting sportsmen for generations; the graceful and commodious wood and canvas Gander River boats that most lodges on the Main Southwest still use; W.W.Doak’s Tackle Shop in Doaktown, purveyor of fine local salmon patterns since the early 40’s. And the effect of that tradition is to lay on the area an evocative patina of pipe smoke and L.L. Bean boots, of gentlemen anglers hailing each other as they pass on the river, of Eastern seaboard accents and guides with long-handled nets. As you fish a pool on the Main Southwest – which, in the beauty of its bars and banks, could serve as the platonic idea for all salmon rivers – or watch a 15-pounder roll in the slow black water of the Cains in October, shattering the reflection of a bankside of brilliant red-and-yellow hardwoods, it is easy to feel as if you were inside and Ogden Pleisner painting. 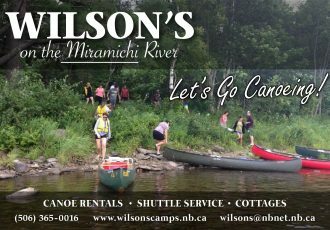 Comfort and friendliness are part of the experience, too: I have fished out of seven different lodges in the Miramichi Valley and have been overfed, entertained, and coddled at all of them.